Updates the Error by URLs view according to this sketch. Start with listing view design improvements. Add icons. Add tooltip skeleton. Fix sources. Meaning that the type and name would be set in $validation_error['sources']['sources'], not in $validation_error['sources']. Is the structure of validation error incorrect for some reason and it should be as assumed in the tests? Maybe the fix should be removing the second nested sources instead, or is it like this for some reason? Thoughts? That's interesting. I couldn't reproduce that issue. Maybe the validation error data model changed. @kienstra Created this WIP PR as a start for resolving #1362, however, I'm going to offline from Wed-Fri (5-7th of September) so if you'd like to pick this up meanwhile or implement together with #1361 (there are a few matching tasks) then feel free to do so. Conform to validation error data model. It look like there aren't double-nested 'source' arrays. So remove the nested foreach loop. Merge in develop, resolve conflict. For example, change 'To Fix Later' to 'Rejected'. like 'No errors by URL found'. Equals sign not aligned with surrounding assignments. Could you please review this, now that the Travis build passes? 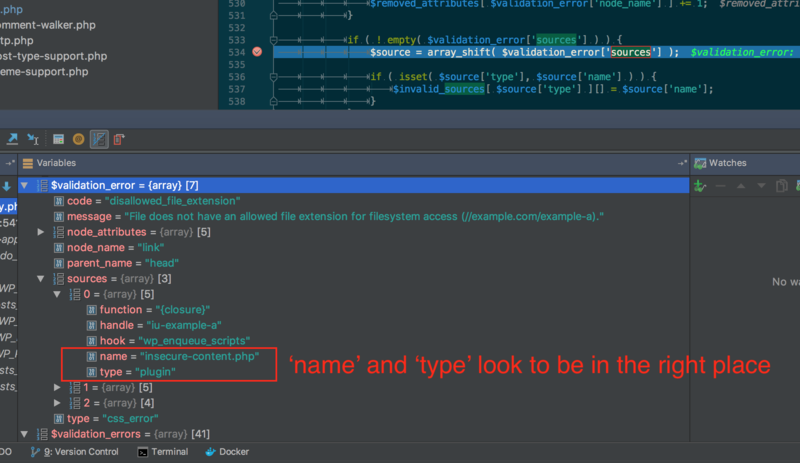 The name isn't stored in the validation error (no should it be). The $sources['theme'] variable contains an array like [ 'twentyseventeen' ]. So this should be looping over each $theme and get wp_get_theme( $theme )->get('Name'). If the theme does not exist, then the slug should be shown instead (and obviously the result is stale in this case). 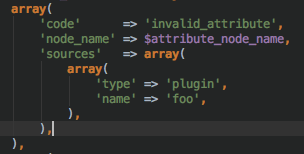 This should obtain the actual names of the plugins using get_plugin_data() and getting the Name returned. If the plugin doesn't exist then show the slug (and this result is obviously stale). Can this name be made more specific? There is enqueue_edit_post_screen_scripts. So should it be enqueue_post_list_screen_scripts? This shouldn't be using string concatenation for constructing HTML. It would be preferable to do var link = $( '<a>...</a>' ); And then do link.prop('href', ampAdminTables.errorsByTypeLink). The text here is not translatable. I suggest doing this: at the admin footer action whenever you are printing scripts, output right to the page the entire link tag with esc_url() and esc_html_e() and such. Give that link an ID and include a hidden attribute. Then in this addViewErrorsByTypeLinkButton function, just move the element in the DOM and remove the hidden attribute. We can remove this if we go with “Invalid URL” per Slack convo. @westonruter I started working on this but realized a dependency of the script you mentioned is wp-dom-ready which is a part of Gutenberg. So this script doesn't load for me since on my test site Gutenberg is not activated. Are we assuming that everyone will have Gutenberg as well or why is this a dependency? Or did I miss something in the build process? Still, npm run dev seemed to build amp-validation-error-detail-toggle.js fine in my local, and that script ran without error on the 'AMP Validation Error Index' page. @kienstra I've added that line to package.json and ran npm run build / npm run dev but the script still won't load on the Error Index page. Am I missing something here? I did have to install webpack and wp-cli but I have those now so I'm not sure if there is another dependency I'm missing since there aren't any errors in the build process now. 'error_status' => sprintf( '%s<span class="dashicons dashicons-editor-help"></span>', esc_html__( 'Status', 'amp' ) ), // @todo Create actual tooltip. The 'error_status' here can be replaced with the AMP_Validation_Error_Taxonomy::ERROR_STATUS constant I believe. I don't think the span shouldn't be included in the translation string. @westonruter , @kienstra found that if you remove the domReady from the webpack config, remove it as a dependency of the script loading, and do npm run dev again we can get the script to run successfully. It is included here: 56915da but it is a workaround, so if you can come up with a fix or have another idea that'd be awesome. Otherwise these changes are ready for review. Thanks @westonruter ! * Output theme name if available instead of theme slug. * Fix logic for obtaining plugin name when plugin is not in directory or plugin file doesn't use slug. * Use innerText instead of innerHTML for security hardening. * Better encapsulate logic in \AMP_Validation_Error_Taxonomy::render_link_to_errors_by_url(). * Update button from "View errors by URL" to "View Invalid URLs". 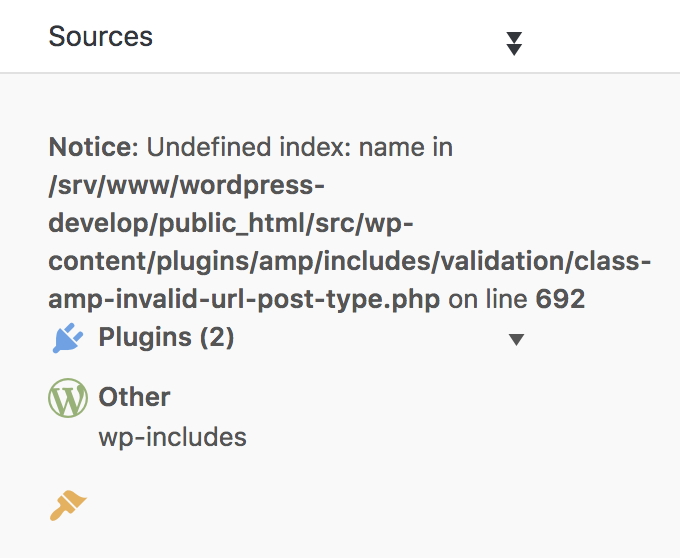 I think the problem is just that @wordpress/dom-ready hasn't been saved as a dependency in package.json. If I add it as a dependency then it builds and works. Your change in 56915da is mostly right anyway as wp-dom-ready is not a registered script, but rather it is an internal dependency that is added to the built script. Fix applied in 716a869. innerText should be used instead of innerHTML because the latter is susceptible to an injection attack, if errorIndexAnchor is coming from an untrusted source. Either this function or AMP_Validation_Error_Taxonomy::render_link_to_errors_by_url() should be refactored to be taking the same approach. 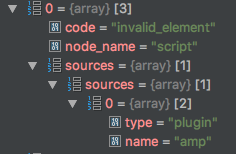 This won't work for plugins that don't have directories or which don't use the slug as the plugin's main PHP file. Still needing to get wp_get_theme( $theme_slug )->get( 'Name' ) here.